Last Sitting for painting is about 1 hour before close, we don't want you to rush. we do have a shelf for work in progress, that may be continued at a later date if you do feel rushed or tired of painting for the day. Ceramic pick up times guaranteed 12-7 pm Tues.-Sat. & Sun. 1-4 pm we are happy to stay just call or text if you will be later than 7 pm. We are usually we are in the back loading or unloading kilns. Historic location at 11 East High Street in Carlisle! 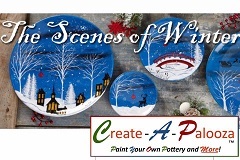 Welcome to Create-A-Palooza, a family friendly art and activity center in heart of Historic Carlisle just east of the main Square! We have a wide range of offerings and welcome all visitors and interests, whether for a quick stopover to paint, or to host an upscale corporate event. We have our own large back parking lot with a rear entrance in addition to curbside parking! Current location 11 E. high Street in downtown Carlisle. 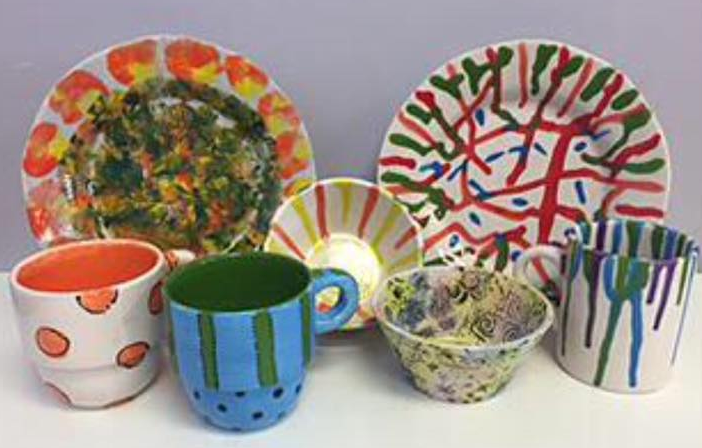 Our studio offers many activities for all ages including "Paint Your Own Pottery", canvas painting, glass painting, Meadowbrooke Gourds projects, soap making, and candle making. We also offer a variety of classes, special events, and activities including canvas parties, movie nights, classes, and seasonal activities. All prices are all-inclusive, meaning: no sitting fees, firing fees, or any other add-on charges. Create-A-Palooza provides a high quality, affordable, and memorable family activity. Have fun producing something personal and unique, and we’re glad to help every step of the way.